Media giant Time Warner will produce shows for audiences on the social media platform Snapchat as part of a new partnership that the two companies announced on Monday. Time Warner, which owns HBO and CNN, will also advertise on the service. The deal comes as television companies look to capture growing digital audiences and rival tech platforms, such as Facebook, add video content. 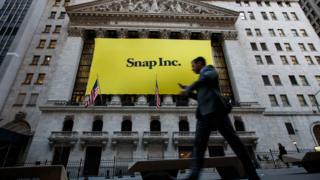 It boosted shares of both companies, sending Snapchat’s stock up almost 2%. Snapchat started in 2011 as a picture-messaging app and now has more than 150 million daily users. It became a publicly traded company earlier this year. The firm has worked with companies, including the BBC, as it broadens the content available. Its shows typically last for three to five minutes. Currently one show airs on Snapchat each day. That number is expected to increase to three by the end of the year, according to the company. Time Warner’s contributions will include comedy and scripted drama. The firm has produced many hit films and TV shows including Wonder Woman and Game of Thrones. The two-year partnership is valued at about $100m, according to Reuters.